OUR supernatural life of Divine Grace comes to us from Our Lord Jesus Christ, Head of His Mystical Body, the Catholic Church, while we continue to receive our disordered natural life from the first Adam. "For, if by one man's offence, death reigned through one: much more they who receive abundance of grace, and of the gift, and of justice, shall reign in life through one Jesus Christ" (Rom. v. 17). Our Lord is then our Head. Now St. Thomas distinguishes a twofold function of the grace of Headship, analogous to the double role exercised by the head with regard to the members of the body. "The head," he says, "has a twofold influence upon the members: an interior influence, because the head transmits to the other members the power of moving and feeling; and an exterior influence of government, because by the sense of sight and the other senses which reside in it, the head directs a man in his exterior actions." (III. P. Q. 8. a. 6) St. Thomas then goes on to remark that Christ also, by His grace of Headship, has a twofold influence upon souls: an interior influence of supernatural life, because His Humanity, united to His Divinity has the power of justification; an exterior influence by His government of His subjects. The role of justification and sanctification is that of Christ as Priest, while the second prerogative of government and direction constitutes the spiritual Kingship of Christ. We have said the "spiritual" Kingship of Christ, for we must distinguish between the spiritual and the temporal Kingship of Christ or between His Primacy in the supernatural order and His Primacy in the natural order. "That this Kingdom, indeed, is in a special manner spiritual and concerned with things spiritual is quite plain from the extracts from Scripture above quoted; and Christ's own line of action confirms this view. He, however, would be guilty of shameful error who would deny to Christ as man authority over civil affairs no matter what their nature, since, by virtue of the absolute dominion over all creatures He holds from His Father, all things are in His Power. Nevertheless, during His life on earth He refrained altogether from exercising such dominion and, despising the possession and administration of earthly goods, He left them to their possessors then, and He does so today" (Encyclical Letter, Quas Primas, of His Holiness Pope Pius XI). Christ's Kingship is, above all, Spiritual. To Jesus Christ then as King, Spiritual Ruler, it appertains to set before the faithful the common end they should attain and to point out to them the means of attaining it, thus guiding the exterior and visible movement of the whole mystical Body to Eternal Happiness. To Jesus Christ as King, it belongs also to determine the proper sanction for the precepts He imposes, to reward and punish His subjects according to their deserts. Finally, it is for Jesus Christ as King, in virtue of the work of Redemption which He must accomplish, to conquer His Kingdom and defend His faithful subjects against the enemies who strive to overthrow His reign here below. Christ's Spiritual Kingship is militant and the struggle against moral evil must go on as long as men remain here below exposed to suffering and death, to corruption and sin. Only in eternity shall the triumph be complete, by the victory of the good and the defeat of the wicked. 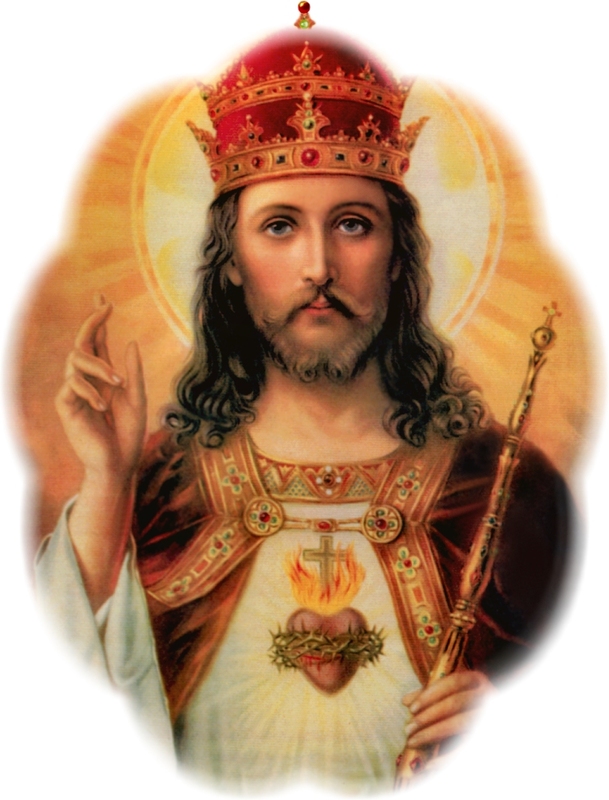 Of course it must not be forgotten that this struggle against evil on the part of Christ the King is in close relation with His Priesthood: for it is by sanctifying souls and uniting them to God that He withdraws them from sin and conquers them for His Kingdom. As has been pointed out above, we must here keep in mind the twofold aspect of Christ's Headship: the negative aspect of His combat against sin and His warring down of evil, which belongs to His Kingship, and the positive one of uniting souls to God, which is the function of His Priesthood. Spiritual Kingship comprises the Right of Intervention in Temporal Affairs. Our Lord, as has been said, came down to restore to men the Divine Life of grace, their highest and most real life, and this mission of salvation confers on Him full power of governing in the spiritual order. But, though we have been raised to the life of grace, we must, nevertheless, continue to live our human life, and the organization demanded by this life remains always necessary. Our human or natural life must, however, be in subordination to our Divine Life, so that instead of hindering its development, it may, on the contrary, indirectly contribute thereto. Grace gives to our activity a new elevation by lifting it up to the God of Revelation, known and loved in Himself, but we have to work out our salvation in the conditions of existence imposed on us by our situation in the world and in contact with the lowly realities of daily life. The temporal order, with the rulers appointed to maintain it, subsists along with the supernatural order and the Ecclesiastical Hierarchy. In both spheres authority is exercised in its proper domain. But, because the temporal is in subordination to the spiritual and because the final end of man, the end which dominates all others, is supernatural, we must concede to the ruler in the supernatural order a right of intervention in the strictly natural sphere, a right which must be measured by the necessity or utility of maintaining and developing the Divine Life of grace in souls. The Spiritual Kingship of Christ, then, comprises the power of intervention in human affairs and, in fact, we see Our Lord in the Gospel making use of it, when, for example, He drove the traffickers from the Temple, thus proclaiming the right of God to be honoured in becoming fashion, even though that meant imposing restrictions upon the commercial liberty of men. It must, however, be borne in mind that this power of intervention in the temporal order does not confer a new royal dignity upon Christ, but is comprised in the attributes of His spiritual Royalty. For it is not here question of commanding and legislating in view of conducting human society to its common good in the natural order, which belongs to the civil power, but of opposing everything that could hinder the progress of the supernatural life and of the social order consonant with it, and of obtaining from the rulers in the civil order the co-operation necessary therefor. This power forms part of the attributes of the Spiritual Kingship, for it is at its service and is so to say its instrument. Here we are no longer concerned with a right of intervention in temporal affairs for the sake of the higher interests of His Mystical Body. Temporal kingship supposes that he who is invested with it pursues a temporal end and that he has directly in view the common good, in the natural order, of the society confided to him and the temporal welfare of his people. Of course there is no question of Our Lord having taken over or being about to take over the government of any particular country or people. The kings and rulers of the earth need not fear that they shall be deprived of their authority: Our Lord's Royalty is universal. But is not Christ the sovereign and judge of all kings and rulers? Has He not a right to rule them as a body, to dictate His laws to them, to reward or punish them for the good or bad use of their power? The Encyclical Quas Primas, in the passage above quoted, answers these questions decisively in the affirmative. To the rulers of the earth it belongs to legislate in civil affairs, to determine sanctions for their laws and to judge their subjects guilty of transgressions of these laws. Our Lord reserves to Himself the right of pronouncing final judgment on the Last Day on the civil administration of all earthly rulers as well as on their attitude to the supernatural order. For rulers will have to render an account both of the manner in which they sought the natural common good of their subjects and of the way in which they observed the objective order of the world that belongs to Christ, by their acknowledgment of the Indirect Power of the supernatural society founded by Him, the Catholic Church, in temporal affairs. [Emphasis added by the Web Master.] This power is, as we shall see immediately, a part of the Church's participation in the spiritual Kingship of Christ. The Church's Participation in the Spiritual Kingship of Christ. The title makes it clear that the Temporal Kingship of Christ has not to be considered here. The mission of the Catholic Church, supernatural and supra-national, is the spiritual one of the outpouring of the Divine Life. The Church has not received purely temporal Royalty from her Divine Founder, so it is here question of Spiritual Kingship only. But the Spiritual Kingship of Our Lord could not be exercised in an efficacious manner without a visible, permanent intermediary, capable of giving to souls at all times and in all places the directions needed for the safeguard and diffusion of the Divine Life. This mission has been confided only to the Catholic Church. Accordingly, in order to form an adequate idea of the Spiritual Kingship of Christ, we must consider its radiation down the centuries in the Church and through the Church in the world. The Pope and the Bishops are the representatives of Christ, the lieutenants of His Spiritual Royalty. They have the charge of holding up before the world the supernatural ideal of life to be lived by all men and laying down the laws and precepts to be observed, in order that that life may not be lost: to them it belongs to regulate the distribution of all the means confided to the Church by Our Lord for the development of the Divine Life, to establish fitting sanctions for all offences that jeopardize the interests of that life, and, finally, to carryon the struggle against the powers of evil by every form of missionary effort, following the example of Christ. Here we must carefully distinguish between the Church's participation in Our Lord's Priesthood and her participation in His Kingship. "The interior influence of grace can come from Christ alone, Whose Humanity united to the Divinity has the power of justifying. But the influence which Our Lord exercises by His exterior government can be communicated to others. Those others are the heads of the Church ... they are heads because they take Christ's place" (Summ. Theol., III. P. Q. 8. a. 6). In other words, when the Church governs in the name of Christ she is truly a proper and principal, though subordinate, cause of her government. Thus, as Spouse of Christ and True Regent of souls on earth, she has the right that we should recognize her authority and should bow down before her. When, on the other hand, through her priesthood and the Sacraments, she communicates grace to us, she is in this, only the instrument used by Christ to vivify our souls. It must, however, be remembered at once that, since the Sacred Humanity of Christ is immediately united to the Word, His Royalty and His Priesthood receive thereby a fullness, a universality and a perfection which can be participated in by the Church only in a limited fashion. St. Thomas points out that Christ rules the men of all places, times, and states, while the heads of the Church either govern only in certain places for a limited time as Bishops, or without limit as to place, but only for a limited time as is the case with the Pope, the rule of both Pope and Bishops being limited to those living on the earth (III. P. Q. 8. a. 6). Besides, Christ commands by His own authority, for all things are subject to Him. The Rulers of the Church have only the authority communicated to them by Christ. The influence, then, which Christ exercises on the world, by His Priesthood and His Kingship, surpasses in extent and compass, even here below, the influence of the visible Church. All men, St. Thomas teaches (III. P. Q. 8. a. 3. c. et ad I), belong to Christ, even though they be heretics or pagans, and on them Christ can act in an invisible manner, by providing them with the help they need, in order to be converted, by even raising them to the Divine Life, if their invincible ignorance keeps them outside the one True Church. The Church always remains the centre from which the Divine Life, which is found in its fullness in Christ, radiates throughout the world. By right the Church is universal and her influence here below ever seeks to be co-extensive with that of her Divine Head and Founder. Men are subject to the Priesthood and Kingship of Christ while yet outside the Church, but in order to reap the full benefit, for the spiritual life, of this subjection to Our Lord, one must be fully incorporated into Christ, in accordance with the order He Himself has established. One must be a child of the Church, to which He has confided the infinite riches of the Redemption. We have previously seen that the Spiritual Kingship of Christ comprises the right of intervention in temporal affairs, in so far as the interests of the Divine Life of souls demand it. Charged by Our Lord with the continuance of His mission here below, the Church, though without direct power in temporal affairs as such, has, nevertheless, by her participation in the Kingship of Christ, the right of intervening in temporal affairs in order to safeguard the interests of the Divine Life. [Emphasis added by the Web Master.] This is the Divine origin of what has been usually called, since the time of St. Robert Bellarmine and Suarez, the Indirect Power of the Pope. Here it may be well to open a parenthesis concerning the Temporal Sovereignty of the Pope in his own State, so as to preclude any confusion in minds between this Temporal Sovereignty and the Indirect Power of which we are speaking. The Temporal Sovereignty of the Pope in the Vatican State is completely different from his Indirect Power in temporal affairs. It is, however, a consequence of the Pope's participation in the Spiritual Kingship of Christ as His Vicar on earth. The Temporal Sovereignty of the Pope in the Papal States or in the Vatican City is the condition by which alone in normal fashion obstacles and hindrances are removed to the enjoyment of that full immunity bestowed on him by Our Divine Lord when He made St. Peter His Vicar on earth, with the charge of spiritually governing the whole Church. That particular Temporal Sovereignty is the normal condition which Divine Providence has provided for the exercise of the Spiritual Kingship of Our Lord's Vicar. Accordingly, the Pope, who is supreme judge, the world over, directly of spiritual matters, indirectly of temporal affairs, by reason of the spiritual interests involved, is also temporal and civil ruler of a small State. In the latter capacity he stands in a special relation to his civil subjects. This chapter is a summary of a series of articles which have been running in the Catholic Mind (Dublin) since April, 1931. In those articles free use has been made of the writings of Rev. Ch. V. Héris, O.P., Professor at the Dominican House of Studies of Le Saulchoir, Belgium, with his kind permission.